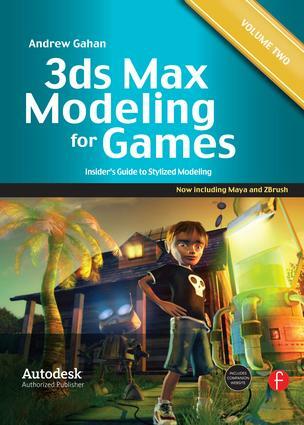 Learn how to model comic-style à la Pixar™ with the expert techniques found in 3ds Max Modeling for Games Volume 2: Insider’s Guide to Stylized Modeling. This new volume will show you the ins-and-outs of stylized modeling, including characters, vehicles, environments, and much more. Follow the story of cover characters Robert and Robot as their adventure takes you through the world of modeling, vegetation, alpha-maps, and much more! This book is also packed with highly detailed tutorials feared toward enhancing your modeling skills and expanding your portfolio. The companion website (www.3d-for-games.com) is unique - an online forum where readers can post and answer questions about their work. In terms of developing a portfolio, online peer critiques are invaluable, and current readers have made use of this feature, in fact some have happily become the forum responders (along with Andy) to coach and develop new artists at work. Also included: step-by-step project files for each chapter; all the relevant texture files and source photos; panoramic skies, small scene objects, bonus texture maps & models so that artists can create whole scenes very quickly without starting from scratch each time; countless examples of what's hot and what's not in 3D modeling and also enough support images and photos to keep the budding artist busy for months. Unrivalled support in over 10,000 current posts - backing up the book with a lively forum and community of readers from all over the world, ready to help your work. Introduction. Introduction to 3ds Max and Basic Modeling Terms. Planning Your Project Including Making a Plan. Adapting a Concept. Vegetation and Alpha Maps. Introduction to Maya. Modeling the Robot in Maya. Gallery. Modeling the Character Robot Using Zbrush. Modeling the House. Polishing Your Scene and Modeling Projects to Complete. Portfolio and Interview. Creating the Initial Cover Image.